Being single with boundaries isn't easy. 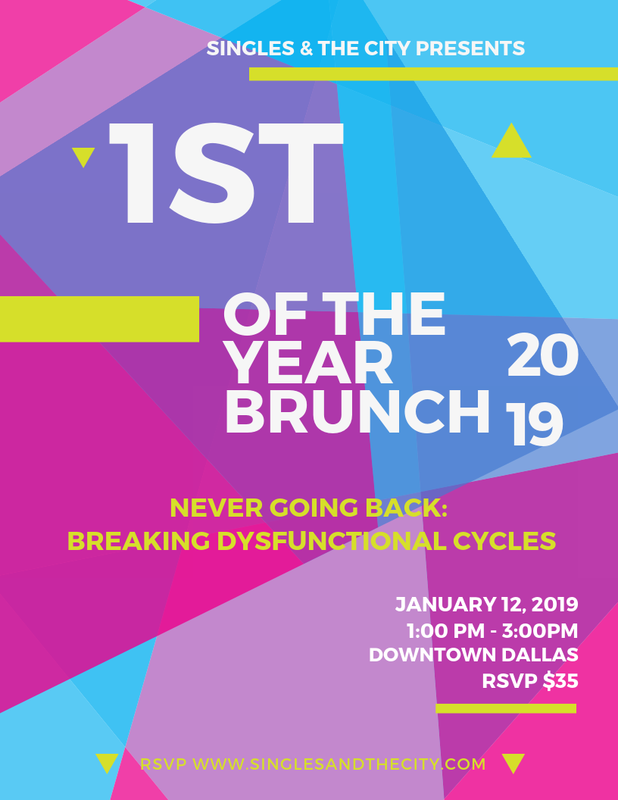 Join us for an empowering brunch that will provide accountability, inspiration and tools on how to conquer dysfunctional cycles of not reaching your goals, temptation, and strength to finish strong. 💡HOW in the world can I find contentment in my Singleness? 💡Is it really worth working on inner healing when NO ONE else seems to be doing the same? 💡What am I supposed to do when it seems like everyone is in a happy relationship but me? You aren't alone! Join us for “The Weight of Waiting" - an empowering event with fresh perspective from those who have encountered trial, error and gained victories in goal setting, business, relationships and Christian spirituality. This is the ULTIMATE ROUNDTABLE & PANEL DISCUSSION FOR SINGLE & DATING PROFESSIONALS! 💡Trying to make better decisions but continue falling into the same cycles? Join us for our 3rd Annual “ 1st of the Year Brunch”! This signature Singles & The City Fall Master class series features fresh perspective from Dallas’ co-ed single Entrepreneurs visionaries, and forward thinking professionals. Packed with authentic, inclusive and interactive activities that intentionally promote engagement between the two sexes; there are no wallflowers at our events! Expert advice from Dallas’ most notable relationship and communication counselors at Balance Beacon. They’re bringing real life experiences, solutions to your challenges, and empowering you to tackle the hard choices and make healthy dating and professional decisions that will have a positive lasting affect on your life. Ain’t nobody got time to go around the mulberry bush yet another time– the cycle stops here! Complimentary bites and beverages are provided by Norma's Cafe! Free parking on Flora St.
Join us for our new series "LEAD: The Effective Communicator". and event that features fresh perspective from single entrepreneurs, visionaries and forward thinking professionals. This event is packed with authentic, inclusive, and interactive activities that will promote intentional engagement between the two sexes, and expect advice from Dallas' renown Von Eaglin MEd, LPC-S and Dewone E. Bennett MS, LPC-S, C-TFCBT. Come expecting fresh perspective, engaging dialogue and solutions on being your best self! Save the date because this Cinco de Mayo we're throwing a day party like no other. Then, after the sun goes down we're kicking off Singles de Mayo! 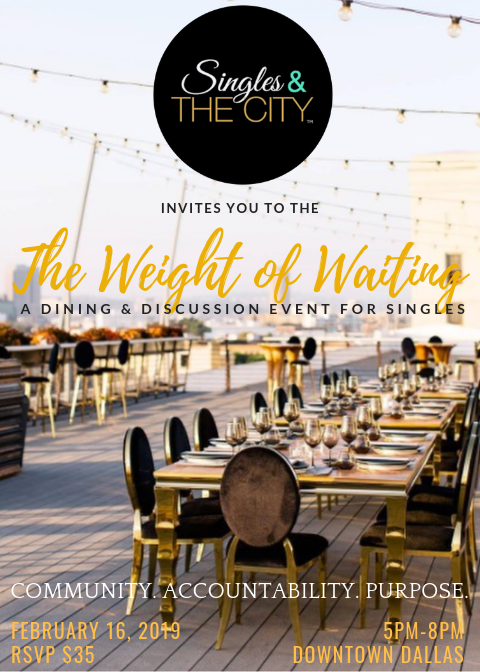 Join us for this event hosted by Singles & The City Founder, OhSoStefanie and Austin's top relationship wellness Counselors, Jessica Worthington. 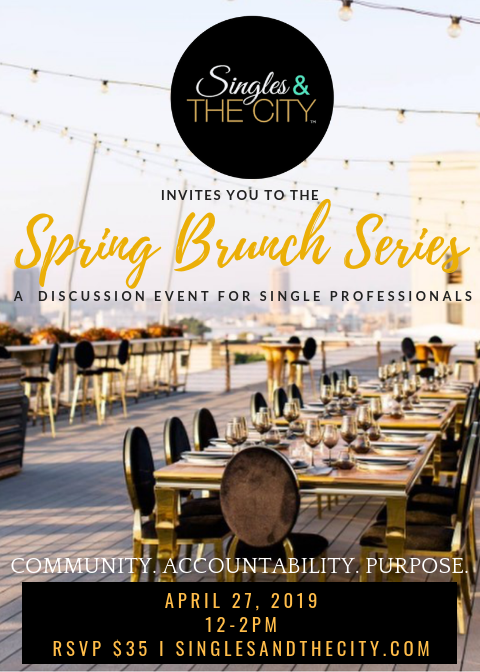 Join us for this event hosted by Singles & The City Founder, OhSoStefanie and Dallas' top relationship wellness Counselors at Balance Beacon. What better bloomin' place to celebrate LIFE and WOMEN for our annual luncheon than the Dallas Arboretum and Botanical Garden? Come support Thrive's life-giving ministry, which offers compassionate care for women and their partners experiencing unplanned pregnancy. Interested in underwriting or buying a whole table of seats for you and your friends? Click the ticket link. Individual tickets available soon. Chrystal Evans Hurst is a writer, speaker, and worship leader in addition to serving as the chief executive operating officer in her home as a wife, mother of five and grandmother to one. She is a self-proclaimed ”geek”; and bibliovore, who is actively seeking help for her addiction to Starbucks, sweet tea, and chocolate chip cookies. Chrystal is co-author of, Kingdom Woman and her second book, She’s Still There coming out this summer. She also blogs and podcasts regularly at Chrystal’s Chronicles where she poignantly reflects her thoughts about her faith and day-to- day experiences. Chrystal firmly believes God’s promise in Jeremiah 29:11, “I know the plans that I have for you…” and she desires to help others believe and apply that truth to their lives. “Pesach food needs better PR,” says celebrity kosher chef Jordona Kohn. Black Violin is composed of classically trained violist and violinist Wil B. and Kev Marcus who combine their classical training and and hip-hop influences to create a distinctive multi-genre sound that is often described as “classical boom.” The band released their major label debut Stereotypes (featuring Black Thought of The Roots and MC Pharoahe Monch) on Universal Music which debuted at #1 on the Billboard Classical Crossover Chart and #4 on the Billboard R&B Chart. Black Violin has shared stages with top names including Kayne West, Aerosmith and Tom Petty, and has creatively collaborated with the likes of Wu-Tang Clan, Wyclef Jean and Alicia Keys. Wil and Kev place heavy emphasis on educational outreach, and have performed for more than 100,000 students in North America and Europe in the past 12 months, including the featured musical act for the Blue Ribbon Festival at the Music Center in Los Angeles, CA where they performed for 19,000 fifth grade students from the Greater Los Angeles area over a 3 day period. The band is endorsed by Yamaha Music, and has partnered with the National Association for Music Manufacturers (NAMM) to continue their advocacy for accessible music education. 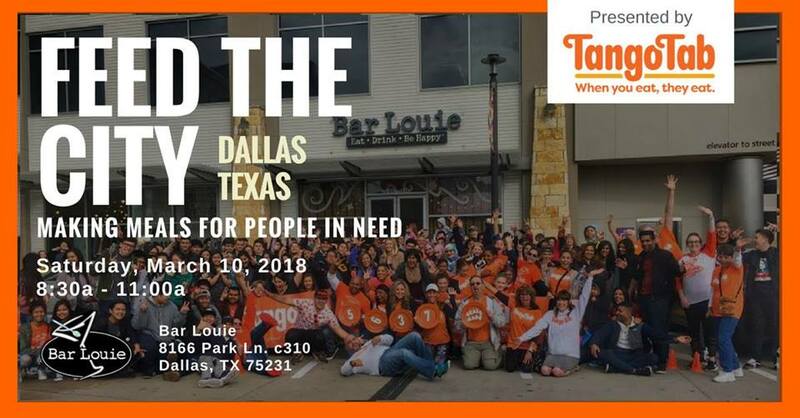 Join us for this event hosted by Singles & The City Founder, OhSoStefanie and Dallas' top relationship wellness Counselors at Sparrow House Counseling. Complimentary light bites and non-alcoholic beverages will be served. No bae...NO PROBLEM! Don't whine and send yourself flowers this Valentines Day - SERVE and VOLUNTEER with Home-Team and Singles & The City! Instead of grumbling about Cupid not capping you in the buttocks, spend the evening volunteering with us this SATURDAY as we host an Ice Cream Social for some amazing kids who are experiencing the fight of their life. You have the opportunity to make a child smile after they have endured such challenges as chemotherapy, luekemia, cancer and organ transplants. What a better way to spend a holiday that is synonymous with LOVE than to show the love of Jesus in a tangible way. We hope you join us this SATURDAY, FEBRUARY 10th as we partner with the Ronald McDonald House of Dallas for this years annual "Valentines Ice Cream Social for Kids". Laugh, Cry, Vent, Recharge and have FUN doing it. You deserve COMMUNITY and we want you here! Get off the sofa, grab a friend and GET CONNECTED with us FRIDAY, JANUARY 26TH at Home-Team!